This afternoon we visited the old US Mint, not far from we were staying. It operated as a mint from 1838 to 1861 and from 1879 to 1909, producing over 400 million gold and silver coins during those periods. This includes a brief period striking coins for the Confederacy in 1861. There are only four Confederate dollars from the New Orleans Mint surviving. However, what I found more interesting was the Music Museum upstairs. Fats Domino (born 1928) is a very influential Rhythm and Blues piano player, eminent since the late 1940s. 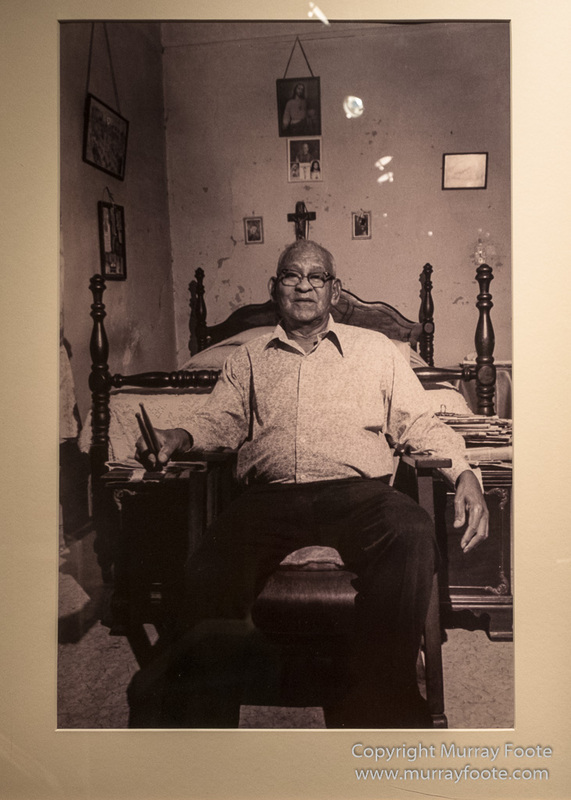 He stayed in his house during Hurricane Katrina, partly because his wife was in poor health. His house was then destroyed by the floods. He was reported as dead in the media but had in fact been airlifted to safety with his family by a helicopter. In the early hours of 1 January 1913, young Louis Armstrong (1901-1971) was arrested for firing a pistol in the air during New Year’s celebrations and sentenced to the Coloured Waif’s Home. There band director Peter Davis began Louis’ formal musical education. Louis started with a tambourine and eventually graduated to the cornet. 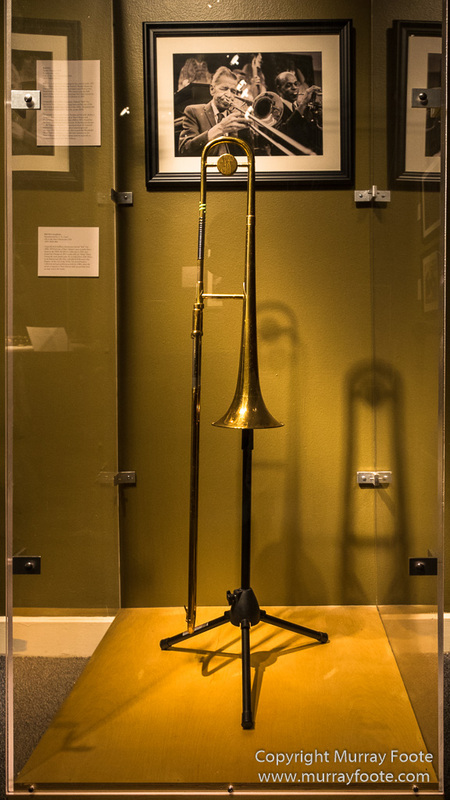 The home’s administrator, Captain Joseph Jones, purchased this cornet at a pawnshop for Armstrong’s use. As his fame grew, the Waif’s Home cherished the cornet Armstrong had played. 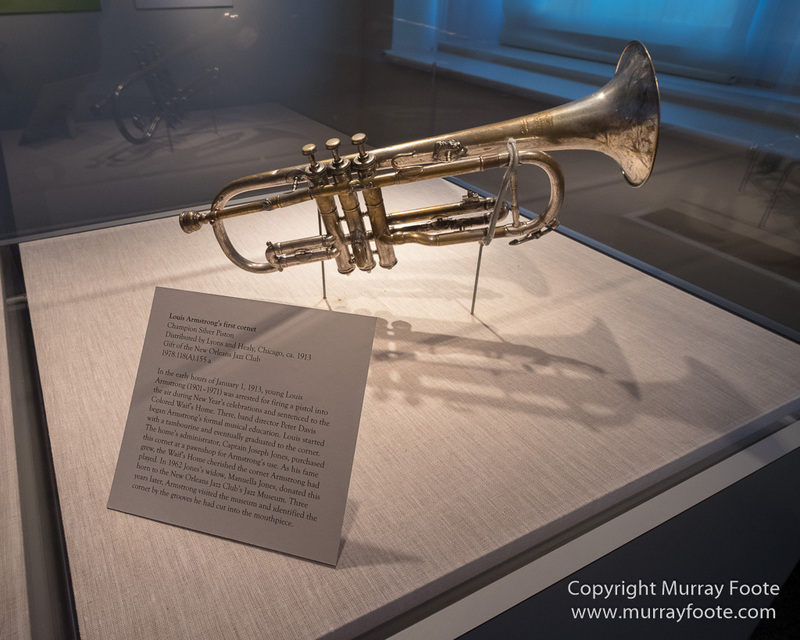 In 1962, Jones’ widow, Manuella Jones, donated this horn to the New Orleans Jazz Club’s Jazz Museum. Three years later, Armstrong identified the cornet by the grooves he had cut into the mouthpiece. The storm surge from Hurricane Katrina in 2005 destroyed the home of Clarence Gatemouth Brown (1924-2005) in Slidell, Louisiana. 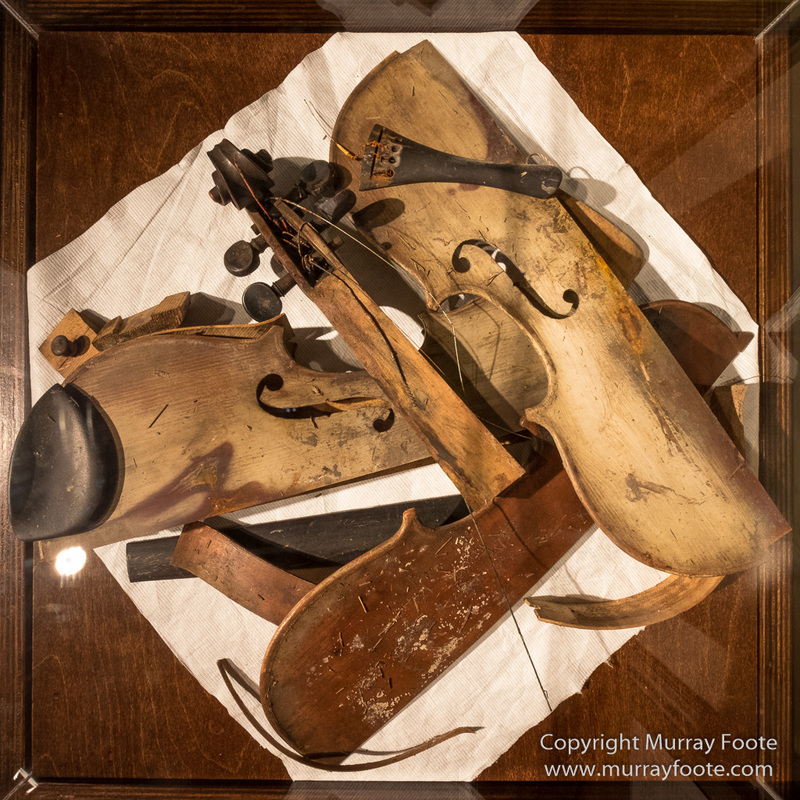 His fiddle, still in a case, was found nearby. Brown had evacuated in advance of the storm but passed away in Orange, Texas just a couple of weeks later. 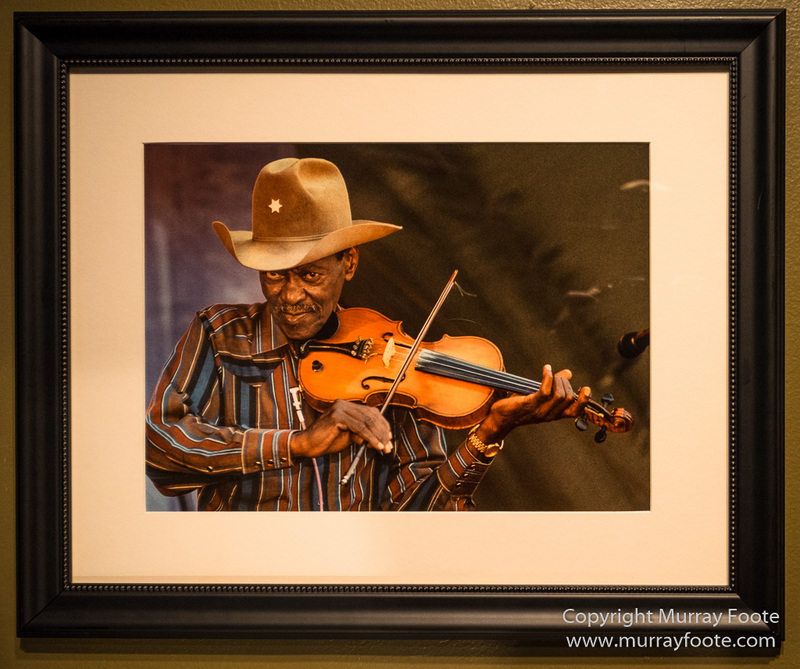 Clarence Gatemouth Brown. Digital inkjet print by Earl Perry, c. 2004. “I refuse to be labelled as a blues player, jazz player, country player,” Clarence “Gatemouth” Brown once said. 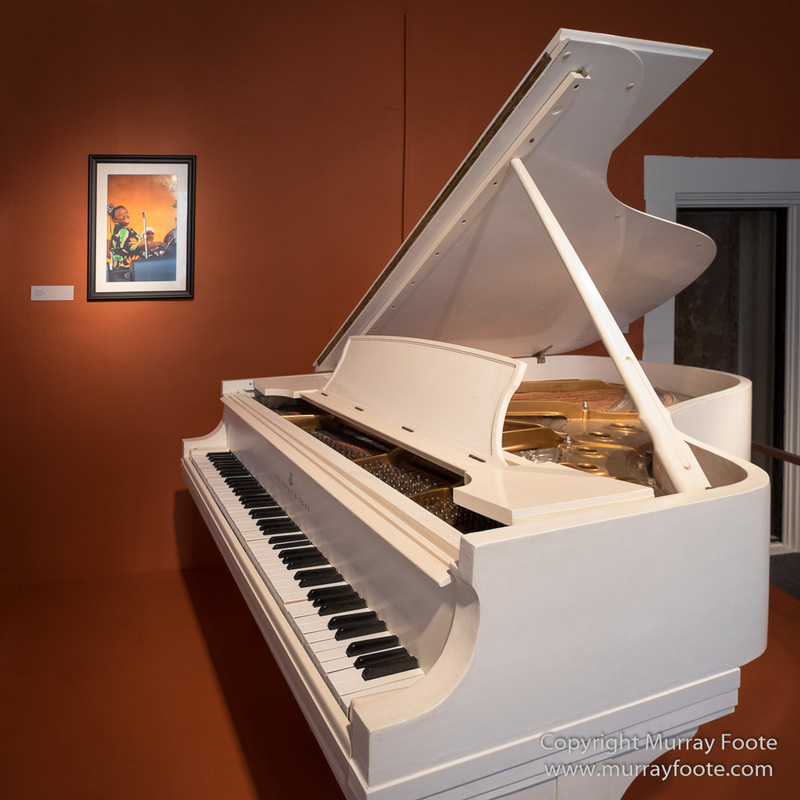 “I’m an American musician.” Born in Vinton, Louisiana and raised in Orange, Texas, he absorbed the music of the Gulf Coast as well as the swing of Duke Ellington and Count Basie, creating an eclectic style. His first hit “Okie Dokie Swamp” (1954), blended jazz and blues. In 1982 he won a grammy for his album Alright Again!. Over his long career, the prolific guitarist and fiddler recorded with Eric Clapton, Canned Heat, Leon Russell and Professor Longhair. Weakened by lung cancer and heart failure, Brown passed away in Orange about two weeks after he evacuated his longtime Slidell home in advance of Hurricane Katrina. Photograph of Kid Ory (gelatin silver print by Yoshio Toyama 1971) and Kid Ory’s trombone. Originally from LaPlace, trombonist Edward “Kid” Ory (1886-1973) led one of New Orlean’s most popular dance bands in the 1910s. He left for California in 1919, then headed for Chicago in 1923 to play with Joe “King” Oliver. During the next several years, he recorded there with Oliver, Louis Armstrong’s Hot Five, and Jelly Roll Morton’s Hot Peppers. At the end of the 1920s, Ory moved back to California and quit performing until the 1940s, when the revival of interest in New Orleans-style jazz put him back on stage and in the studio. 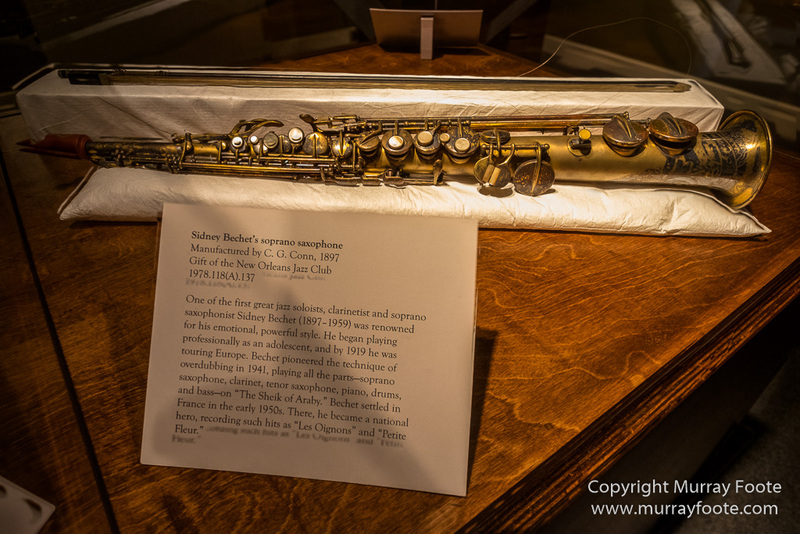 Sydney Bechet’s soprano saxophone (manufactured 1897). One of the first great jazz soloists, clarinetist and soprano saxophonist Sidney Bechet (1897-1959) was renowned for his emotional, powerful style. He began playing professionally as an adolescent, and by 1919 he was touring Europe. Bechet pioneered the technique of overdubbing in 1941, playing all the parts – soprano saxophone, clarinet, tenor saxophone, piano, drums, and bass – on “The Sheik of Araby”. Bechet settled in France in the early 1950s. There, he became a national hero, recording such hits as “Les Oignons” and “Petite Fleur”. 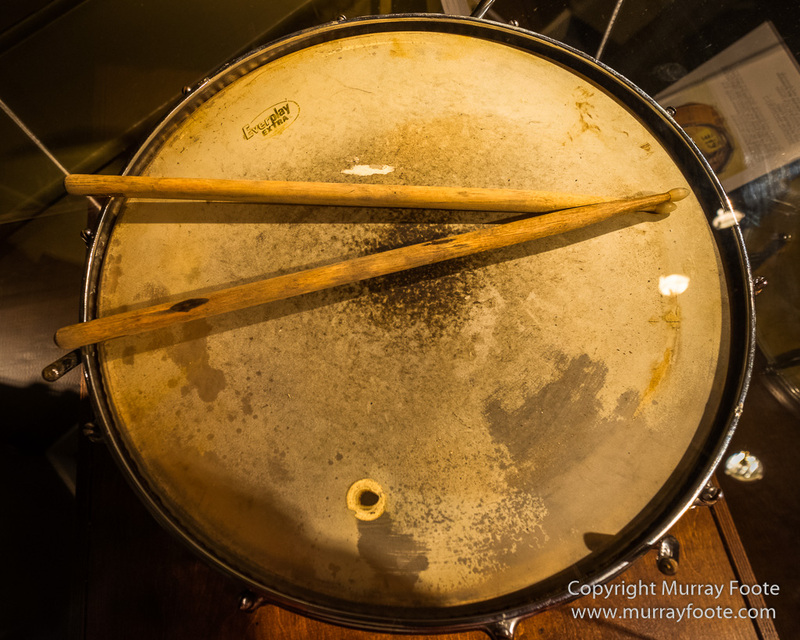 Cie Frazier’s tom-tom and drumsticks. 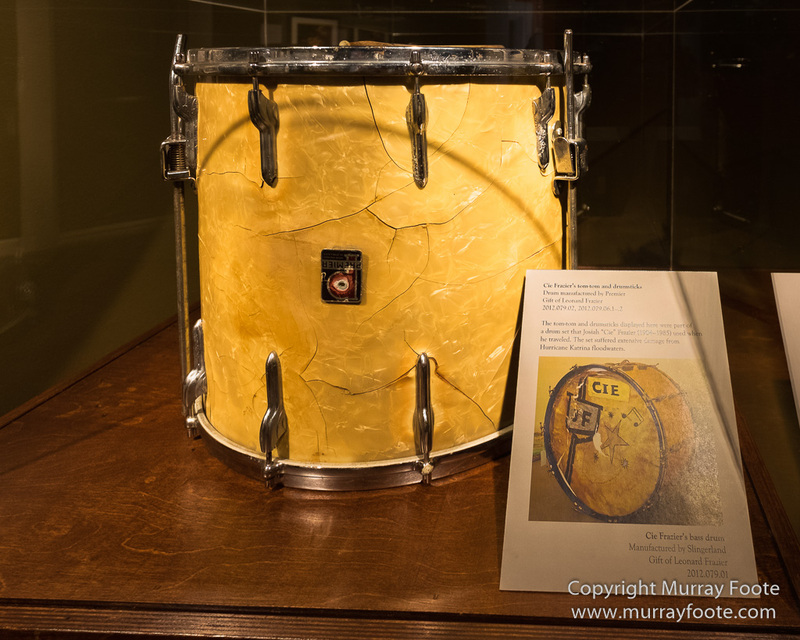 The tom-tom and drumsticks displayed here were part of a drum set that Josiah “Cie” Frazier (1904-1985) used when he travelled. The set suffered extensive damage from Hurrican Katrina floodwaters. Cie Frazier, Gelatin silver print by Lee Friedlander, 1982. Many consider Josiah “Cie” Frazier’s playing the epitome of New orleans-style jazz druming. In his early years, he performed in orchestras led by Armand J Piton, Sidney Desvigne, Oscar “Papa” Celestin and John Robichaux. Frazier played with a number of brass bands and performed regularly at Preservation Hall from its earliest days. Emile “Stalebread” Lacoume’s banjo (manufactured c.1900). 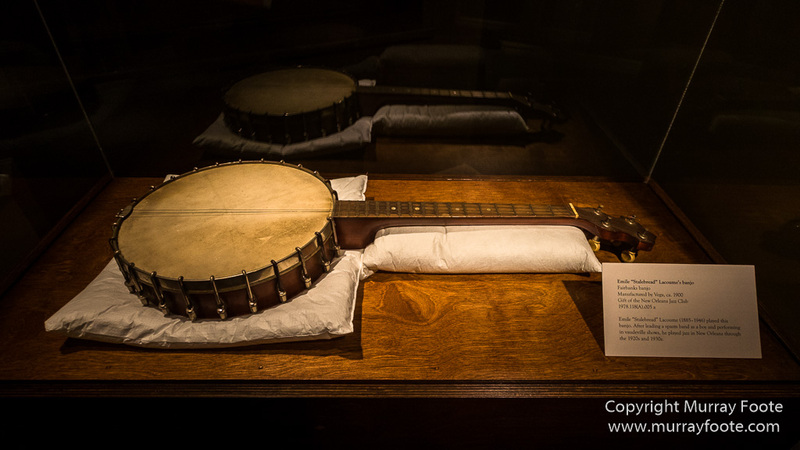 Emile “Stalebread Lacoume (1885-1946) played this banjo. After leading a spasm band as a boy and performing in vaudeville shows, he played jazz in New Orleans through the 1920s and 1930s. 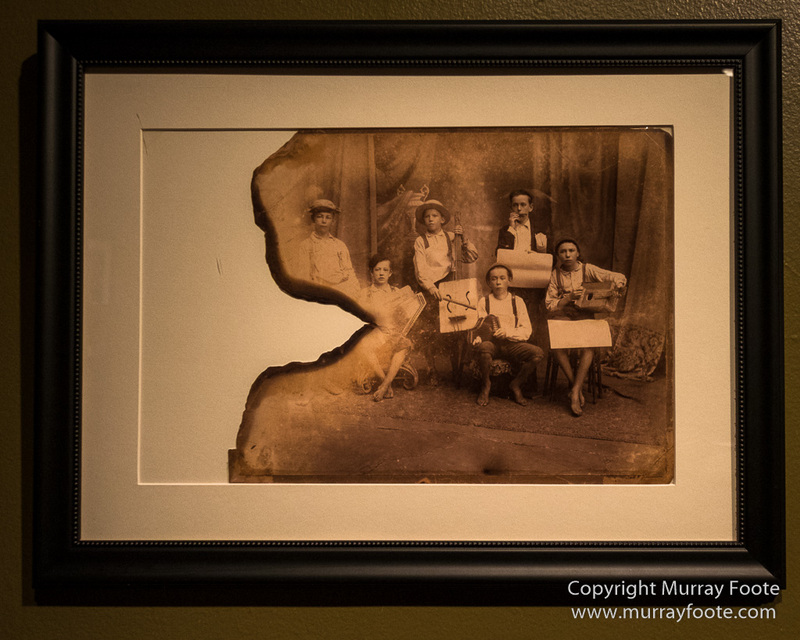 Emile “Stalebread” Lacoume’s Razzy Dazzy Spasm Band, Albumen print, 1899. In the late 1800s, newspaper boy Emile Lacoume (second from left), performed on the streets of New Orleans. Homemade instruments and improvised music were the hallmarks of such groups. Stalebread, who once said he got his nickname from bread he hoarded from his band, went on to play jazz professionally as an adult, despite the onset of blindness shortly after this photograph was taken. He performed with the halfway house Orchestra in the early 1920s and later with the Charles Fishbien Orchestra. 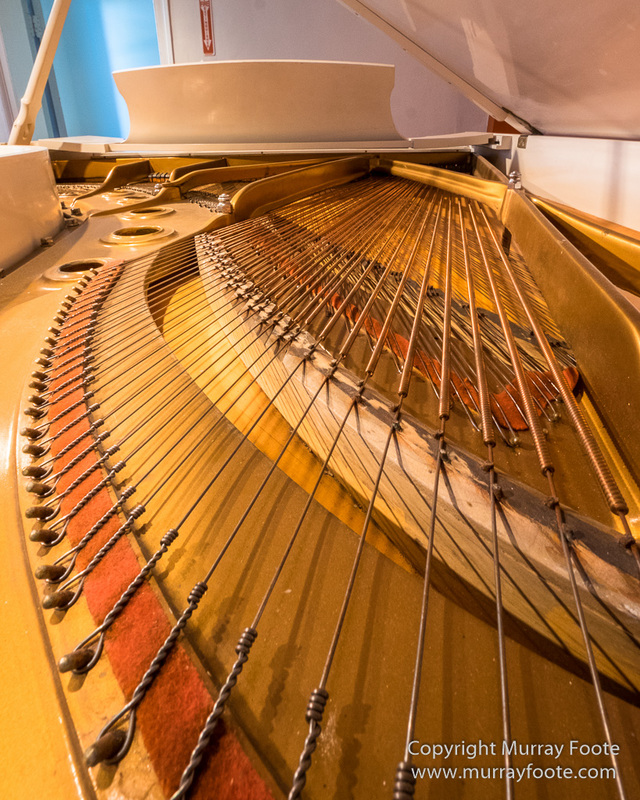 This entry was posted in Blues, New Orleans, USA and tagged Art, Blues, History, Hurricane Katrina, Jazz, Live Music, Louisiana Music Museum, New Orleans, New Orleans Mint, Photography, Travel, USA.